IN medications can be drawn up in a syringe and administered immediately using the MAD®: (Mucosal Atomiser Device) into one or two nostrils. The IN route can also be used when a patient is unable to take oral medication due to nausea and/or vomiting. Absorbed by the highly vascular mucosal membranes, the onset of action is considerably faster than the oral route as it does not require gastrointestinal absorption. Fentanyl is a potent opioid, approximately 100 times more potent than morphine, and with a shorter duration in action. 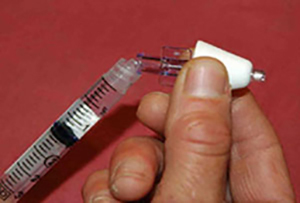 Using the MAD®: in administering medication reduces the need for obtaining IV access. Precautions if child has blocked nose or URTI as there may be unreliable drug delivery. Any such patient should have their nasal cavity gently suctioned prior to administration. Filter needle to draw up medication. 1.5 micrograms/kg/dose (use 50 microgram/ml solution) of medication. Explain to patient/parents what you are going to do. All medications must be administered as per hospital guidelines and individual manufacturer’s instructions. Follow the An Bord Altranais guideline for the safe administration of medication: right drug, right route, right time, right dose, and right patient. Draw up the medication as prescribed by the Doctor and attach the syringe to the atomiser device. Draw up dose plus additional amount 0.1ml for dead space. Attach the atomiser tip via the Luer lock mechanism, it should twist into place. 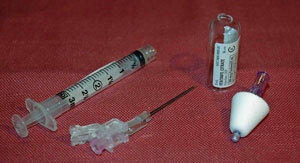 (This allows the syringe to be kept horizontal). Check the patient’s nostrils for blood or mucus discharge. Suction the nasal passage prior to delivery of medication. The patient should be reclining at a 45°. Using your free hand to hold the crown of the patient’s head stable, place the tip of the atomiser against the nostril snugly and aim for the centre of the nasal cavity. For dosages of 1 ml or more the volume should be halved in each nostril. Briskly compress syringe plunger and spray contents quickly into the nostril - medication will expel like a mist in one rapid dose. Hold atomiser for 5-10 seconds after administration. Document all care given; and evaluate the effectiveness of the Fentanyl delivery and record any adverse reactions. Record vital signs after administration of opiate medication delivery. Heart rate, respiratory rate, oxygen saturation, pain score should be recorded 5 minutes after administration. If sedated or abnormal vital signs, inform treating doctor and continue observations every 5 minutes until return to baseline. A second dose may be given after 10 minutes. After the last dose has been given, a further set of observations at 10 minutes should be completed then half hourly for one hour. Borland M, Jacobs I, King B, O'Brien D.(2007) A randomized controlled trial comparing intranasal fentanyl to intravenous morphine for managing acute pain in children in the emergency department. Ann Emerg Med 2007;49(3):335-40. Borland ML, Jacobs I, Geelhoed G. (2002) Intranasal fentanyl reduces acute pain in children in the emergency department: a safety and efficacy study. Emerg Med (Fremantle) 2002;14(3):275-80. Hockenberry, M.J. and Wilson, D. (eds) (2008) Wong’s Essentials of Pediatric Nursing, 8th Edition. Mosby, St Louis. Shepherd, M. (2007) Intranasal Fentanyl. Starship Children’s Health. 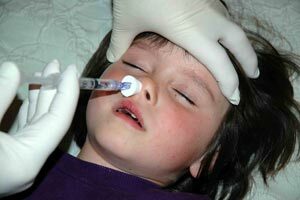 Wolfe, R. (2010) Intranasal medication Delivery for Children: a Brief review and Update. Pediatrics. (10) 2010-0616. Younge PA, Nicol MF, Kendall JM, Harrington AP. (1999) A prospective randomized pilot comparison of intranasal fentanyl and intramuscular morphine for analgesia in children presenting to the emergency department with clinical fractures. Emergency Medicine 1999;11(2):90-94. Content By Prof. R. O' Sullivan, Dr Íomhar O' Sullivan date. Last review Dr ÍOS 3/12/18.